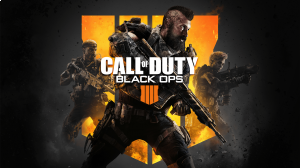 Call of Duty: Black Ops 4 is a multiplayer first-person shooter that is the sequel to the 2015 game Call of Duty: Black Ops III. The game is set in the 21st century as you fight the war against terrorism. Black Ops 4 does not feature a solo campaign, instead it only focus on multiplayer with a mixture of traditional modes, Zombies and a new battle royale mode in the form of Blackout. The Solo Missions mode delves around the backstories of the game's multiplayer characters, known as 'Specialists'.